Naming your little bundle of joy is once-in-a-lifetime opportunity. There is no "Next time". You should not give your child just "any name". Give your child the best possible name. The name you give your baby is going to be with her/ him for the rest of her/ his life. It's not a question of one day, one month or one year. ...Don't compromise with the child's fate. Choose a name for your baby which is phonetically in harmony with the instance of her/his birth. The RIGHT name for a new born baby, is the best gift the parents can give for their child’s success, thereby giving them a head start in life to lead a healthy, wealthy and prosperous life. After going through the sample of "Phonetically Correct Name for you" report, on your website, I think that this report is basically meant for a newly born child going to be named. My understanding is that this report will not be of much help/use for me. What do you think? This is a myth. Perception is totally wrong. Click here for more details. Know about practical uses of Best/ Lucky number(s) in daily life. You should strive to apply your best number(s) in every walk-of-life, as much as you can and should avoid the unfavourable numbers. ,.. that's the success mantra. * The list of suggested "Hindu" names confirming to astrological parameters is optional and payable extra as indicated above. Thank you very much for trusting in my astrological services and giving me the opportunity to analyze your child's birth chart. Naming your little bundle of joy is once-in-a-lifetime opportunity. I congratulate you that you didn't compromise with the child's fate and striving to choose a name for your baby which is phonetically in harmony with the instance of baby's birth. The RIGHT name for a new born baby, is the best gift the parents can give for their child’s success, thereby giving him/her a head start in life to lead a healthy, wealthy and prosperous life. As per the above birth-data, child's Vedic (sidereal) ascendant is Aquarius ('Kumbha'), the Vedic Moon sign ('Rashi') is Scorpio ('Vrashchik') and Janma-nakshatra (birth-star) is Jyeshtha (pada-3). Please be reminded that do not confuse it with child's tropical (Western) ascendant and tropical Moon-sign, which may be same or a sign higher (in this case, tropical ascendant is 'Pisces'). Vedic Numerology is the study of the planetary rulership through nine primary numbers. It is based on the vibratory resonance of each number. Vedic Numerology is a sacred study as it enables us to look deeply into the wheel of karma and adjust our attitude and behavior in the world. Absolutely everything is based on etheric vibration, the higher the frequency, the more force it contains. This report is completely based on Vedic astrology (Jyotish) principles. It is neither based on child's "Birth-date" nor on "Sun-sign". Instead, it is based on the planetary configurations present in child's "Birth-chart", and therefore, highly customized. It is quite different from Western numerology based reports in it's approach. Though, planetary rulership through nine primary numbers and Chaldean (Kabbalistic) numeric equivalents to Roman alphabets are same. BUT, the similarity ends here. Vedic Jyotish deal with numbers from one to nine, the seven luminaries, plus Rahu and Ketu, the nodes of the moon. Everything is reduced to a single digit, so even if you have a compound number, such as twenty one, when reduced to a single digit, becomes a three. The Chaldean System of numerology has its roots in Ancient Babylon. This system is related to the Vedic System of India and the Kabbalah System of the Hebrew mystics. The underlying premise of Chaldean numerology is that every letter has a unique vibration. Roman alphabets are assigned numeric values, from 1 to 8, based on their vibrational value (and not in the sequence of alphabets). The number 9 (nine) is considered 'sacred' and is not assigned to any alphabet. There is another system popular in numerology these days, called 'Pythagorean System', where numbers are assigned by sequence to various English alphabets. In fact, the Pythagorean System is the dominate numerology in the western world. Author of this report do not follow Pythagorean system. Only Chaldean system has been used throughout which has given him consistent results on hundreds of real-life case studies. As told above, each alphabet of our name carries a vibration, and can reveal a lot about the person's inherent talents, challenges and opportunities. Sometimes it becomes necessary to change one's name to gain lost ground. With a pseudonym, stage name or a spiritual initiation it is common to add another vibration or assert a different identity to accompany the souls intent for transformation and a higher frequency. There is an ancient connection between the phonetics of Sanskrit, the mother of all languages, and the special constellations, called 'Nakshatras', spanning the zodiac of Vedic Astrology, the mother of all predictive sciences. 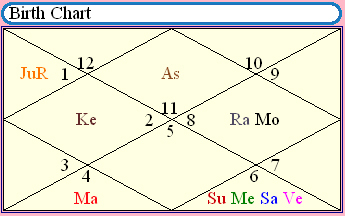 A nakshatra is made up of four equal divisions called 'Padas' (or, 'Charans'), divided over a period of approx. 24 hours. Normally a 'nakshatra-pada' changes about every six hours. Each nakshatra pada/charan is associated with a particular sound syllable. The 27 nakshatras landmark the zodiac, giving a total of 108 nakshatra padas and corresponding sound syllables. These sounds which are 'tantrik' in their source are considered auspicious and are believed to enhance (optimize) the 'destiny' of the native through unfoldment of higher human potential. One's birth nakshatra is the constellation the Moon is posited at time of birth and plays an important role in determining one's personality make-up. It is true that the hidden potential of a person can be activated for life by a particular cosmic sound that corresponds to an individual horoscope. Vedic-Indian astrology pioneers this art. Under Vedic system, every letter is said to confirm to a definite pattern of sound ('Dhwani'). Vedic astrology suggests that certain patterns of sound are more in harmony with the instance of child's birth. The 'Naamkaran' (Baby Naming) ceremony dates back to the Vedic era which is normally done on the 10th, 12th or 18th day after the birth of a child. The basis of a child name rests solely on the 'Nakshatra' (birth constellation) falling in the 'Moon Sign' (rashi) he/she is born under. The initial sound-syllable of child's name should normally begin with the exact syllable (written below) representing child's Moon rashi-nakshatra. However, if a suitable name starting with above mentioned syllable can not be found, then, alternatively, an initial sound-syllable from the group of syllables having the utmost harmony with child's birth star may be chosen. But, never choose initial sound-syllable for child's name, which is passive, and not in harmony with child's birth star. Sound-syllables, with friendly vibrations, may be used by the child in future for various purposes, besides choosing own name, such as naming his/her business, a product, naming his/her house and even pets. A separate report, titled - "The suitable Phonetic Syllables for Child", is also being sent with this report. It will provide an exhaustive analysis on phonetic syllables having the utmost harmony with child's birth star. The report will also list the passive phonetic syllables which are not in harmony with child's birth star. Hyper-link to this report has also been provided at the start of this main report. Once the correct initial sound syllable ('Adyaakshara') have been found out, note down some names (or different spellings of a name) starting from that syllable. You must now strive to choose a name for the child, with the spelling - which returns a Chaldean (Kabbalistic) primary root number representing the planet which is most benefic in child's chart (determined through intricate Vedic astrology principles). This report determines the functional benefics and malefics, as told by sage Parashara, and the principles told in various streams of Vedic Jyotish to measure the exact benefic or malefic nature of the planets in child's natal chart. The relative importance of various astrological parameters has been calibrated very carefully - as told in ancient Vedic Jyotish texts. This calibrated scale has been referred as "Vjyotish beneficence scale" in this report. At times, some special Jyotish principles may over-shadow the net result obtained through the normally used Parashari principles to determine the beneficence of a planet. In such cases, these special principles will prevail and may reduce (or enhance) beneficence of a planet considerably. This report considers these special principles also. benefic, however it is also 8th Lord (Dusthana Lordship) simultaneously. functional benefic to Mercury and treat it as a neutral planet instead. Moon is 6th Lord and is highly malefic functionally for Aquarius ascendant. on how they are placed and how they are associated in a horoscope. recommend the most suitable primary root number(s) for the child. if they are well endowed. are considered to be auspicious. houses 6, 8 and 12 are extremely malefic. as it is the last member of the group. time of death is promised, they can cause a disturbance of the health. comparison between these OFB values will finally make the base of my recommendation for the most suitable primary root number for child's name and other purposes. ** CAUTION: Mercury is in 'Mrityu-Bhaag'. results. There is a separate MB point for each planet in each sign. In this birth-chart, the maximum OFB value is 173.73, got by VENUS. On the other side, the minimum OFB value is -114.48, got by KETU. Therefore, the Venus stands out as the best functional benefic planet for the native while Ketu has been determined as the most damaging (functional malefic) planet in native's chart. The "Overall Functional Beneficence" (OFB) values of various planets, shown above either as a positive number or as a negative number, is the result of consolidation and quantification of various key astrological factors. It is, in fact, much more than just considering the house lordships of the various planets. Pronouncing a name in 'Phonetically correct way' is very important. If parents are changing spelling of child's name, it should be done in a way that name keeps its basic characteristics and inherent meaning intact. Everyone also pronounces the name in similar way. For example, if you wish to add an extra 'a' in 'Shyam', you may make it 'Shyaam'. In both cases, this name will be pronounced similarly and it's inherent meaning ('Krishna' - the Hindu God) will remain the same. However, if you add the extra 'a' to make it 'Shyama', it's pronunciation will change phonetically and it's meaning will also alter completely. If girl's name is 'Rajani' don't corrupt it by changing it as 'Rojani' or 'Rujani'. 'Rajani' has a meaning while 'Rojani' or 'Rujani' are meaningless words. 'Shubham' can't be spelt as 'Shubhaam'. 'Indra' should not be converted to 'Eindra' or 'Iendra'. Adding extra i's and a's needlessly, as shown in the above examples will only create a confused personality as the phonetics will be incorrect and everyone will pronounce child's name differently. Higher the beneficence value for a primary root number, greater is the astrological suitability of that primary root number for the child. Vice-versa to it, the lower beneficence value for a root number denotes it's unsuitability. Lower the beneficence value, more unsuitable it becomes. For the child, best number is '6' (Six) for all general purposes. On Vjyotish beneficence scale, it scores the highest value (173.73). The spelling of child's popular name should return '6' as it's primary root number. If child name's current primary root number is different, try making some amendments to the spelling of child's name to achieve it's root number as '6'. However, if for any reason, it is not possible to find a suitable name-spelling with root number '6', the second best choice is root number '8' which scores second highest Vjyotish beneficence value (130.42). You should never adopt the spelling of your child's name which returns the primary root number '7' (Seven). It scores the lowest Vjyotish beneficence value (-114.48). However, in future, when child grows and wish to name his/her own company, business, product, house, pets, expeditions of adventurous nature, creative projects etc., he/she may also consider using the following primary root numbers, for the specific purpose concerned, with the condition that these numbers are not categorized as 'inadequate', 'Poor' or 'Worst' in the above table. In case, the following numbers are below-average in his/her main-table (shown above), preference should always be given to the main-table and following numbers should be rejected. It would become even more better if the 'total count of the constituent alphabets of a name', also returns the desired root number. This principal should be applied to select the 'Best' name, from a list of several names, all of which are returning the desired primary root number for their spellings. In such a case, you must also consider the root number returned by 'total count of the constituent alphabets'. If a name is found returning the desired primary root numbers in both tests, i.e. (a) in its phonetics, and (b) the alphabet count; you must give priority to that name above others. All numbers work very individually through each human body and being, because each one of us have a unique genetic code, karmic blueprint and subsequent behavioral pattern. We see that indeed our perceptions and reality are influenced by the planets in such a way that the mathematical beauty becomes obvious. The material world without the governing influence of the numbers and their presiding planets would be chaos. You may go through several case-studies listed at our web-site for better understanding and proper usage of this report in various spheres of child's life. My explorations and delight as a professional Vedic Numerologist have confirmed the efficacy of this science so many times and with so many people. You can play with numbers in every aspect of child's life as a simple, clear and concise system to enjoy, and enhance human dynamics. It is a wondrous tool indeed. The above calculations (for 'Best' and 'Worst' primary root numbers) are practically applicable in every area of child's life - such as, child name, his/her School roll number, mobile phone number, vehicle number, pet's name etc. When he/she grows, the same principle applies to his/her business-name, product/brand name, house-name etc. There is a maxim that - 'You want fame - Numbers are the game'. During case studies, it has been found that even if the name of native's dog returns a primary root number which is suitable to the native, the dog has brought fame to the native in dog-shows etc. Absolutely everything is based on etheric vibration, the higher the frequency, the more force it contains. Therefore, apply your child's best number in every walk of his/her life as much as you can. Following case studies will provide you valuable insight about the possible uses of this analysis in almost every sphere of your child's life. The primary root numbers of native's own name, as well as native's establishment/ company are very important indicators of his/her success. A qualified doctor could not perform well in his professional life due to his own phonetically unsuitable name as well as the name of his clinic. The primary root numbers of company's name and the product name can make it successful or a failure. See an interesting case study. Many of the times, it has been observed that the employees or associates, name of whom returns a primary root number, and/or starts with a syllable, which are suitable to the native, are faithful to the native. Vice-versa is also true. Do not under-estimate the mystical powers of the vehicle registration numbers. Here is a case study on 15 vehicles of a single Cab-service operator. Results are just amazing. The names of most of the key persons involved in Rajiv Gandhi's assassination conspiracy, the militant organization and even the date of assassination and name of State, when put to a Vedic numerology analysis in the back drop of Rajiv Gandhi's birth-chart, were found to confirm the mysterious principles of this age old science. Results are simply amazing. Some of my clients have even applied this principle on stock-trading. They have found to their amazement that those stocks normally gave them profits, whom 'spoken name' returned a suitable primary root number. Phonetically un-suitable stocks were loss makers. You can take tip from these examples and apply it any where. see the precision of the numbers at work. As a language system Vedic Numerology is quick to implement in mathematical calculation, is practical, portable and instantaneously helpful. Although it is entirely possible to play the numbers in the mundane, like the lottery, Vedic Numerology is a sacred study as it enables us to look deeply into the wheel of karma and adjust our attitude and behavior in the world. I don't advise you to utilize this sacred science in such matters as gambling and lottery. This is the master table of Chaldean numerology. Roman alphabets are assigned numeric values, from 1 to 8, based on their vibrational value (and not in the sequence of alphabets). The number 9 (nine) is considered 'sacred' and is not assigned to any letter. The primary root numbers, calculated for various possible spellings of the name(s), submitted by you, have been shown below. If you need more such calculations, please download 'Vjyotish-exl' from http://www.vjyotish.com. It's 'Free Astro utilities' section contains a small utility through which you may calculate Kabbalistic primary root numbers yourself, for any name or spelling, based on Chaldean system. As told earlier, the initial sound-syllable of child's name should normally begin with the exact syllable representing child's Moon rashi-nakshatra. However, you may also choose other sound syllables from the group of syllables having the utmost harmony with child's birth star. I have a database of more than 13,000 Hindu names (for both genders, combined) along with an elaborate computer program to select appropriate Hindu names with utmost accuracy, which fulfills all desired astro-numerological parameters (discussed above) for naming a child. A detailed report on various suggested Hindu names is annexed herewith separately. Hyper-link to this report has also been provided at the start of this main report. Get ready to harness the power of Vedic Astro-numerology to get luck working for your beloved child's health, wealth, prosperity and peaceful life. God Bless your child ! !